One of the joys of working in my role is how many people I speak with who are wonderful, good-hearted people. They love giving back, whether it’s money they give to charities, religious organizations, or even family and friends. Sometimes I talk to people who volunteer so much to help a cause that it’s like they have a second job. This is all very commendable. But what happens when you give so much money to others that you don’t have enough left to build your own emergency fund, save for retirement, or cover your own bills? Or when you spend so much time helping, you aren’t able to pick up more hours to help meet your own financial goals? Or what if your family and friends look to you to bail them out of financial trouble, help them start a business, allow them to come live with you for free, etc. but then leave you in the lurch with big bills? This is a common situation I encounter, and I admire people with such big hearts, but I also feel for them because I know that the solution isn’t to just stop doing it. Here are some thoughts and ideas I’ve shared with people who feel torn between a desire to give back to others versus taking care of themselves. The good news is that there are ways to be creative and do both. 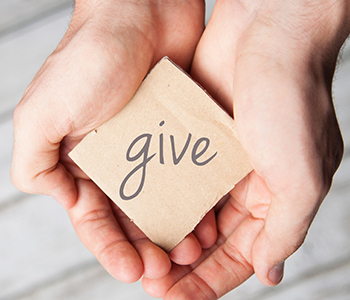 If you typically give cash donations or pay people’s bills for them, don’t forget giving your time can be just as beneficial as giving actual cash. You can help serve food at the homeless shelter, volunteer for the kids’ ministry or another ministry at church or spend an evening cleaning at the local animal shelter. If you’re more inclined to help out people you know, the same concept applies: what about rolling up your sleeves to help someone repaint their house so they can save money, or be available to help them babysit while they go on a job interview? It’s tempting to keep up a level of giving you’re used to even after you may have had a drop in your income or even an increase in your overall expenses. You can still give at a level that works for your budget AND volunteer some of your time or services. If gift giving is the issue, plan ahead for birthday and holiday gifts and buy items on sale. Have a game plan for your spending, so you aren’t caught off guard. Are they unable to work due to physical or health issues? Perhaps they qualify for government assistance like food stamps or Social Security Disability. Help them do the research and apply. Did they lose a job? They might be eligible to receive unemployment pay. Offer to wait with them at the office while they apply. Do they make too little money in general and are struggling to make ends meet? United Way is a great resource to see what programs they might be eligible for within the county where they live. Some programs will give them funds towards paying bills. Beyond that, you can be a resource and help them figure out next steps when they can’t pay their bills. Are they going through something that has them down emotionally, which also might be negatively impacting their performance and work and in other areas of their lives? Have them check with their HR department at work to see if they have access to a counselor through an Employee Assistance Program (EAP) at work. Did they recently have a baby and are struggling with the added financial responsibilities? Here are some employee benefits that could help new moms/parents in general. Is the baseline issue that they aren’t able to get a handle on how they manage their money? Help them create a budget and find ways to cut back and find extra money in their current budget. Be a good role model and show them how to do it, rather than just giving them money. Sometimes all a person really needs is a caring friend to empower them to get on their feet and hold them accountable for taking the steps to helping themselves. Helping others and giving back can bring great joy and a sense of purpose, so keep that up but remember to make sure you are financially sound first. That puts us in a better position to best help others along the way.